I grew up on the coast of British Columbia and came to California in 1951 as a teenager. After graduating from Glendale High School I earned a BA Degree in Applied Arts at UCLA in 1961. I studied bronze casting at Cal State Long Beach. I learned to work the entire lost wax casting process from beginning to end. This involved creating a clay model, making my own wax and investment all the way to the foundry pour. In 1968 I moved north with my family to Ukiah and later to Sonoma, Ca for twenty years. There I worked, carving large public sculptures in black walnut, and smaller work in various woods, plaster and soapstone. I also made and taught woodblock printing. 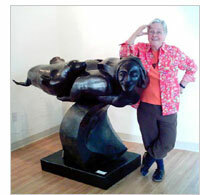 I moved north to Westhaven in 1993 and continued to carve large and small wood sculptures in cypress, spruce and pine. Since 2001 I have had four major bronze sculptures cast, starting with a half life-size (12 feet long)Grey Whale and Calf. The whales and the other three sculptures are displayed on public sites in Trinidad and can be viewed on this website. I’ve continued to work in printmaking and smaller sculptures in various materials. I have been an artist all my life. The process and challenge of creating has sustained me through the years of raising a family, living in community and understanding what it is to be human at this incredible period of history.